I think this is a half(?) of my collection. There are two other shelves too for figs and manga etc. I really love my detolfs ;u; If I had a bigger apartment I'd definitely buy more! This pic is 3 years old. are those cabinets from ikea? escape_rope (Il y a 6 ans) #1426423No not really. If you saw my home you'd understand. If I got a smaller sofa and replaced some shelves to different ones it could be possible. But a student like me can't buy and change my furnishing just like that. It would be really hard to get rid of the old shelves too. I took some crappy photos for you yesterday (sorry I didn't bother to arrange things better) img.photobucket... (lol, spot my smexy ruler!) img.photobucket... The desk area is the ugliest part of my home! 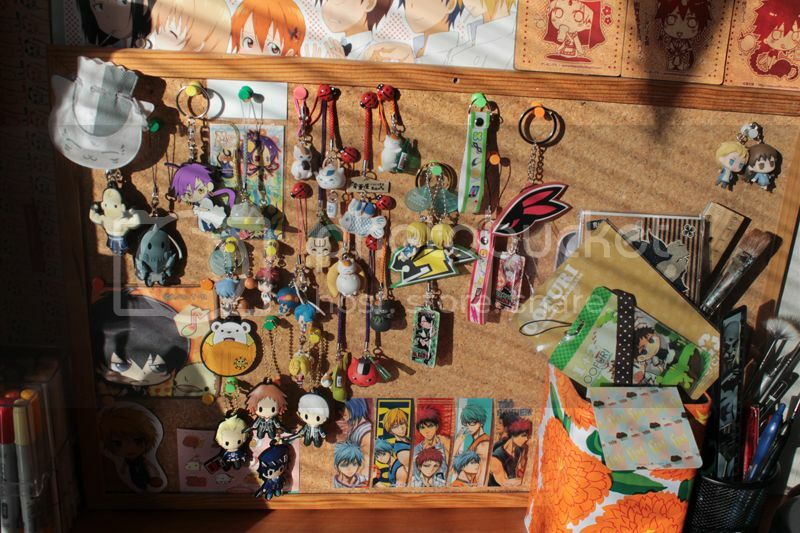 And the cork board aren't even attached to the wall, how lazy can I be! xD I really love your magnetic board and after seeing it I actually remembered I own one too but it hasn't been the wall for year or two? oh why..
Yavimaya (Il y a 6 ans) #1424551ahh yes, it looks a little cramped already xD don't you have space for more detolfs? even for one? hm half of my straps is attached to something, but the rest hangs in random places (like on my plushie's legs lol) and it irritates me because I don't know how to display them neatly and nicely :I and I have only a magnetic board so it's quite problematic to hang anything there. No not really. If you saw my home you'd understand. If I got a smaller sofa and replaced some shelves to different ones it could be possible. But a student like me can't buy and change my furnishing just like that. It would be really hard to get rid of the old shelves too. yeah I know the frustrating part too! xD And damn how much my legs start to hurt after arranging things for a whole day. It's because I don't seem to sit down at all but moving all the time and standing. I'm usually so into it that I forget to take breaks and eat&drink :0 lol, so enjoyable! escape_rope (Il y a 6 ans) #1424535Thanks! It's getting cramped tho, the nendo shelves I mean. I want more detolfs! I need to display more than 20 figs outside glass which is not nice. And I have unboxed ones as well :< Dust gets inside detolfs too but it's not like you have to dust every month. I haven't done so yet and it's been 6 months. Now it looks like I'd need to take the figs out and clean up the shelves from dust. ahh yes, it looks a little cramped already xD don't you have space for more detolfs? even for one? 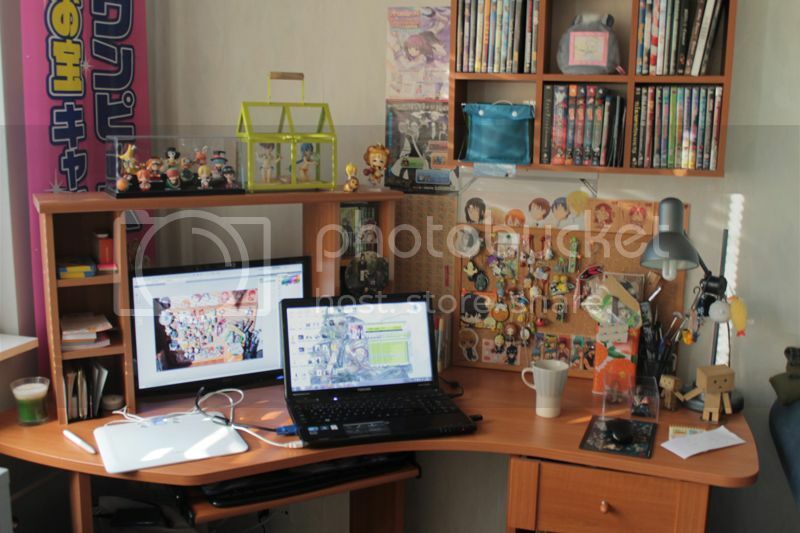 Yavimaya (Il y a 6 ans) #1424449aww your detolfs look awesome! I'm so jealous... ; n ; I like how you arranged nendos! aww your detolfs look awesome! I'm so jealous... ; n ; I like how you arranged nendos!